MARY* FIRST STARTED smoking cannabis 22 years ago when she was 14 years of age. Drugs were a fixture in Mary’s life throughout her teens. As time wore on, she moved onto taking ecstasy and speed. “I grew up in a disadvantaged area in Tipperary where taking drugs was normal,” she says. Another fixture of Mary’s life has been loss. One brother died suddenly when he was 14, the other when he was 30. “I continued to use drugs as these traumatic things happened in my life,” says Mary. 10 years ago, Mary’s partner also died – and life become almost impossible to handle. 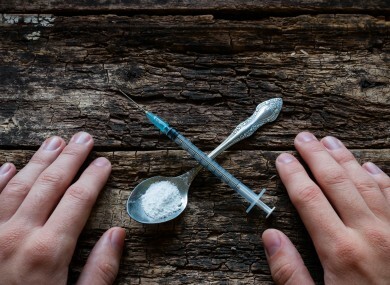 I eventually turned to heroin – and then I ended up in prison. I was in the height of addiction, and my addiction took me to prison. Earlier this week, the Coolmine Therapeutic Community launched its 2015 Annual Report. The community is a drug and alcohol treatment service located in different parts of Dublin. This a holistic, community-based care plan – where the reasons behind addiction are explored through therapy and counselling. In many cases, addiction issues are seen as the effect of a person’s issues, rather than the cause. Mary would eventually find her way into Coolmine and out the other side clean, but first she had to admit that she had a problem. “It was hard, it was tough in prison – I felt like I didn’t fit in, even though I was in for what I was in for,” says Mary. Years of taking drugs had damaged many of her family relationships – with her siblings and with her daughter. I suppose I embarrassed and hurt them and there was no getting through to me. After finding herself in prison, she decided to try to get clean. “Just in prison I decided to give it a go,” she says. The drugs just weren’t working anymore and so I applied to work in a training kitchen first. Mary was in prison in the Dóchas Centre in Dublin city. As she worked in the training kitchen, she became more determined to give up drugs for good. She asked could she enter a drug treatment programme and after being assessed she was admitted to Ashleigh House in Coolmine within a couple of weeks. “Everything started to change from there,” says Mary. I can’t say enough about the place. One of the first things they taught us was just to be honest with ourselves. I found I was myself there – when I hadn’t been myself for 20 years. Alan Connolly, chairman of Coolmine, says that while abstinence is what they try to teach people at the centre, it in itself is not enough to keep a person clean. The community places a huge importance on therapy and relationships – and teaching its clients how to live full, fulfilling lives. Mary says that as her therapy went on she began to learn her own self-worth, how to be assertive and how to change her long-term behaviour. After seven and a half months Mary moved from Ashleigh House to the step down programme. She is now in aftercare and will graduate the programme fully in August. She is now 18 months clean, is working voluntarily at the lodge three months and has applied to do French and Business in colleges in Dublin. “I was an A student in school back when I was a teenager. I stayed in school right up to my leaving cert and then never sat my exam,” she says. “It would have been impossible to imagine this before,” says Mary. She also says that she is restoring her relationships with her family – and is close with her 18-year-old daughter. “It’s all about how addicts feel – we feel we’re not worth it and we can’t do it and everything. Coolmine builds you up from the bottom and I’m just amazed some days how far I come and the benefits of being clean. Mary says she will stay in Dublin – surrounded with a new life and positive people who don’t use drugs. “I wouldn’t be able to live where I came from,” she says. I don’t go back. Too much memories and trauma… I wouldn’t survive there. Mary’s name has been changed to protect her identity. Email “"I was in the height of addiction, and my addiction took me to prison" - 22 years of drug taking”. Feedback on “"I was in the height of addiction, and my addiction took me to prison" - 22 years of drug taking”.